On and around two key dates, World Toilet Day on 19 November 2012 and World Water Day on 22 March 2013, campaigners including many FAN members will come together and join forces to organise mass global campaign actions in countries across the world. 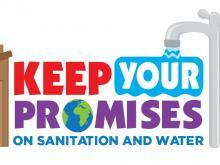 The Keep Your Promises campaign will culminate at the MDG Summit in New York in September 2013, when the global petition will be presented to decision makers showcasing the global movement for change and calling on them to take action to ensure sanitation and water for all. Decision makers have made promises locally, nationally, regionally and globally to get safe drinking water and sanitation to the world’s poorest countries and communities – but words are not enough! These promises must be kept to bring an end to the global sanitation and water crisis. The Keep Your Promises campaign is local, national, regional and global. Promises have been made at all levels and we demand to see these promises kept. The Keep Your Promises toolkit contains lots of information about how to get involved with this campaign. Download it today and start planning your campaign events (PDF 1Mb). Also see the Keep your promises manifesto (PDF 290Kb). Versions of the toolkit will be soon available in French, Spanish, Portuguese, Swahili and Hindi. On and around World Toilet Day, 19 November 2012, Keep Your Promises Hearings will take place in countries and communities across the world. These Hearings are public forums, conversations or meetings at which campaigners will call on decision makers to honour the many local, national and regional commitments they have made to get sanitation, water and hygiene to their citizens. Local officials, civil servants, government ministers and other decision makers will be asked to report on the progress they have made on their sanitation, water and hygiene commitments and to share their plans for ensuring their promises are kept and targets are reached. Has your local or national decision maker made a commitment to improve the sanitation, water and hygiene situation in your local area or country? Organise a Hearing to ask them about their progress towards this commitment and to call on them to make sure this promise is kept. Your hearing Your ‘Keep Your Promises Hearing’ can be as small or large as you want it to be. You could invite a number of decision makers, members of your community and journalists and hold a big public forum or you could simply hold a small meeting with your decision maker at their office. What you decide to do will depend on your country context, your budget and how much time you have to plan your Hearing. The Hearing can link to your own ongoing advocacy, as a tool to support your current strategy and campaigning. You could use the online budget advocacy resource www.WASHwatch.org to find out more about the commitments made in your country. You can use your Hearing as an opportunity to start collecting signatures for the Keep Your Promises petition! Ask people in your family, organization and local community to sign. You could even ask your politician at the Hearing. Join in with the World Walks for Water and Sanitation taking place from 16 to 24 March 2013 by organising a Walk in your local area. Invite your decision maker along and ask them to keep the promises they have made on sanitation and water. Last year more than 370,000 people from 70 countries participated in the World Walks for Water and Sanitation – let’s make this year even bigger and better! The petition will call on all decision makers to keep their promises to take action to end the water and sanitation crisis, and achieve sanitation and water for all. You can download the petition and then edit it to make it relevant to your local or national context for use in your national campaign too! Include your own campaign demands in the petition, for example asking for the construction of toilets in your town or village, or increasing the proportion of GDP spent on sanitation and water. You can then collect signatures in your local community and hand the petition in to your local or national decision maker. What will the Keep Your Promises petition be used for? The campaign culminates at the UN MDG Summit in New York in September 2013. We will present the Keep Your Promises petition at this Summit, calling on all decision makers to keep the promises they have made on the sanitation and water crisis and work towards achieving sanitation and water for everyone. The Keep Your Promises website will soon be live but, in the meantime, keep in touch with updates on twitter @WASHpromises and on facebook at www.facebook.com/keepyourWASHpromises.